Regardless of whether you're sick or healthy, there are bacteria inside you. In fact, there may be as many as 100 trillion bacteria in your digestive system alone. The foods you eat impact these bacteria, which makes eating probiotic-rich foods, like Greek Yogurt, an important part of everyone's diet. Greek yogurt has live cultures that make it a healthy, probiotic-rich food. Probiotics are healthy bacteria that support the function of your digestive system. A healthy digestive system and gut microbiome can improve the health of your whole body. These bacteria typically produce lactic acid, encourage the growth of healthy bacteria in your gut and improve the overall health of the digestive system. While all of these bacteria are healthy, they don't all play the same role in your digestive system. Yogurts can typically be characterized into two main types: standard cultured yogurts and probiotic yogurts. Standard cultured yogurts can have bacteria like Lactobacillus bulgaricus and Streptococcus thermophilus. These bacteria help support the healthy bacteria inhabiting your gastrointestinal system, but don't usually take up residence there themselves. In contrast, probiotic yogurts are made up of bacteria like Bifidobacterium bifidum and Lactobacillus acidophilus. Unlike the standard culture bacteria, these bacteria are like the ones that live in your gut. Consuming Greek yogurt with live cultures will likely provide you with a wider range of health benefits, like improved digestion and health. According to the National Yogurt Association's official website, AboutYogurt.com, the Food and Drug Administration requires that all yogurt products be made with active cultures. However, even when yogurts are labeled with the term live cultures, this doesn't necessarily mean that they have enough live cultures to benefit your health. Many commercial yogurts are heat-treated. This removes their beneficial bacterial cultures, or reduces their amounts. Frozen yogurts may or may not have probiotics; it depends on whether they've been made with heat-treated yogurt. If the Greek yogurt you've selected has the Live and Active Cultures seal from the National Yogurt Association, the yogurt you're purchasing should still contain enough probiotics to benefit your health. You can also purchase any type of yogurt and add probiotics if you're in doubt — or make your own yogurt at home. 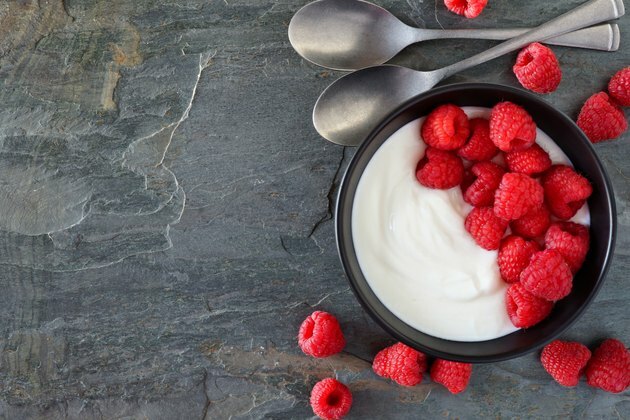 Greek yogurt can improve the health of your gastrointestinal microbiome regardless of whether it's a standard cultured yogurt or a probiotic yogurt. However, you'll probably reap the most health benefits from Greek yogurt with probiotics. Bacteria are typically associated with disease. However, human beings rely on bacteria. In fact, there may be as many bacteria in people as there are cells in the human body. This means that the bacteria in the body, especially the trillions of bacteria in the digestive tract, are incredibly important, as their balance can profoundly affect your health. The balance of bacteria in your gut is known as the microbiome. The gut microbiome can affect various components of your health, such as your personality, immune system and central nervous system. It can also affect whether or not you suffer from digestive system issues, like irritable bowel syndrome. In addition, many people don't realize the importance of the digestive system to the brain. However, the gut and brain are linked directly, via the longest cranial nerve in the body, the vagus nerve. The vagus nerve is able to detect the different types of microbes in your digestive system's microbiome. Since this nerve plays a major role in a variety of health problems, like inflammatory bowel disease and other biopsychosocial diseases, the bacteria in your gut can play a major role in symptoms, disease progression and overall health. The vast majority of commercial yogurt products you'll find sold in supermarkets are very sweet. If you're looking to reap the health benefits of yogurt, stay away from products with added sugars and opt for more natural products, like Greek yogurt. Greek yogurt has 9 grams of protein and 4 grams of carbohydrates, none of which come from fiber. It also has 5 grams of fat, half of which come from saturated fat. In comparison to regular Greek yogurt, low-fat Greek yogurt is similar in nutritional value but has some variation. Obviously, the main difference is the lower fat content; there are only 1.9 grams of fat in every 100 grams of low-fat yogurt. As with regular yogurt, about half of this fat content is saturated fat. The nutrients in both regular Greek yogurt and low-fat Greek yogurt are fairly similar. There is more selenium, for instance, (23 percent of the daily value) and 10 percent of the DV for vitamin A, while there is none in regular Greek yogurt. However, there's less vitamin B12 (22 percent of the DV) and slightly less vitamin B2 (18 percent of the DV) in low-fat Greek yogurt compared to regular yogurt. Although you might be tempted to opt for a different type of yogurt with less fat or carbohydrates, Greek yogurt (even the low-fat variety) is better at reducing blood glucose. This is because of its high protein content, which most other yogurts don't have. Nature Microbiology: GABA-Modulating Bacteria of the Human Gut Microbiota.